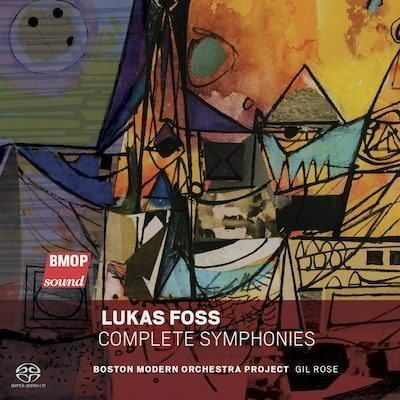 Released last month by the Boston Modern Orchestra Project, this 2 disc recording collects all of the symphonies by Lukas Foss. Even if these were not good performances – they are – this would be a valuable recording since Foss’s symphonies have been unjustly neglected. Mr. Foss was, from the start of his composing career, considered an important voice in the burgeoning world of American composition, along with Aaron Copland, Samuel Barber, Elliott Carter and Leonard Bernstein. And like Bernstein, he enthusiastically championed the works of his colleagues. But where Bernstein, in his compositions, melded jazz and theater music with a lush symphonic neo-Romanticism — or wrote theater music outright — Mr. Foss preferred to explore the byways of the avant-garde, focusing at different times on techniques from serialism and electronic music to Minimalism and improvisation. The First Symphony (1944) is, not surprisingly, the most harmonically conservative, and it has a recognizably “open,” American sonority. It’s extremely attractive, lively, a bit Coplandesque, and well worth however much attention you have to give it. No. 2 (1955-6), subtitled “Symphony of Chorales,” is based on Bach although you might not guess it at first. The initial Toccata (sound clip) gives a good sense of Foss’ ability to write in a more challenging idiom that’s nonetheless extremely arresting. Lot’s of music takes Bach as its inspiration, but not so much of it sounds this good and makes something truly original out of the model. Symphony No. 3 “Symphony of Sorrows” is not as miserable as its title might suggest. Composed in 1991, its second movement “Elegy for Anne Frank” is very touchingly done, sensitive but never mawkish or sentimental. The third movement, inspired by “The Wasteland,” sounds aptly post-apocalyptic, but the concluding “Prayer” assures us that ultimately all will be well. The 1995 Fourth is sparse and austere, somewhat in the manner of Shostakovich’s Fifteenth. Its highlight is the long slow movement (sixteen minutes), a ghostly march with lots of soft percussion interspersed with fragments of quasi-folk tunes played on the harmonica, accordion, and Jew’s harp. It’s quite haunting.